Apple is preparing to release a new iPhone with a larger screen later this year, and while multiple reports have indicated that the screen will be larger, the exact dimensions of the screen and its resolution have so far been guesswork. Some industry watchers have speculated that Apple could stretch the iPhone software’s interface and retain the iPhone 5s’s screen resolution of 1136 x 640. This approach would allow all iOS software and App Store apps to function normally on the iPhone 6 without work from developers. The downside of this approach would be that the iPhone 6’s display would fall below Steve Jobs’ somewhat arbitrary 300 pixels per inch definition of ‘Retina’ for a phone. Before discussing the resolution and scaling changes for the next-generation iPhone, it is important to understand the history of the iPhone’s screen. Back in 2007, Apple introduced the original iPhone with a display with a resolution of 320 x 480. That is 320 pixels horizontally and 480 pixels vertically with a diagonal screen size of 3.5-inches. Apple retained this screen with the succeeding iPhone 3G and iPhone 3GS. In 2010, Steve Jobs introduced the iPhone 4 with Retina display. The iPhone 4’s screen was much sharper than its predecessors’ displays, but the actual screen size was exactly the same as the previous iPhones. To create this effect, Apple quadrupled the number of pixels in the display panel and doubled the pixel density of the graphics across iOS in each direction in order to create a sharper screen with the same physical button sizes across the system. 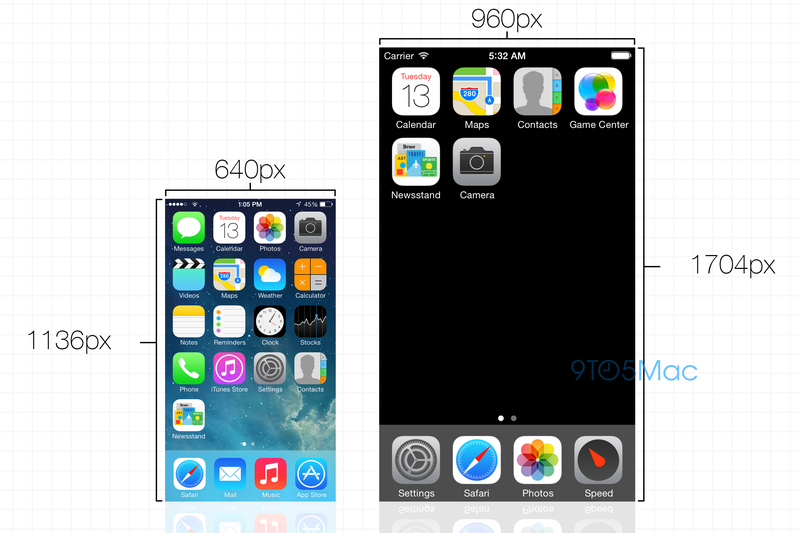 The new resolution was 640 x 960, which is double the prior iPhone’s resolution on both axes. The move from the iPhone 3GS to the iPhone 4 doubled the iPhone screen’s pixel density from 163 PPI to 326 PPI, and Apple claims that a display density over 300 PPI is considered “Retina” quality. With the move to the Retina display, iOS automatically rendered text and core system elements at the new “2X” resolution, but both Apple and third-party App Store developers were required to redesign all of their graphics in order for the images to appear sharp. Otherwise, the smaller images would render at two times their actual size, which would cause a pixelated effect. 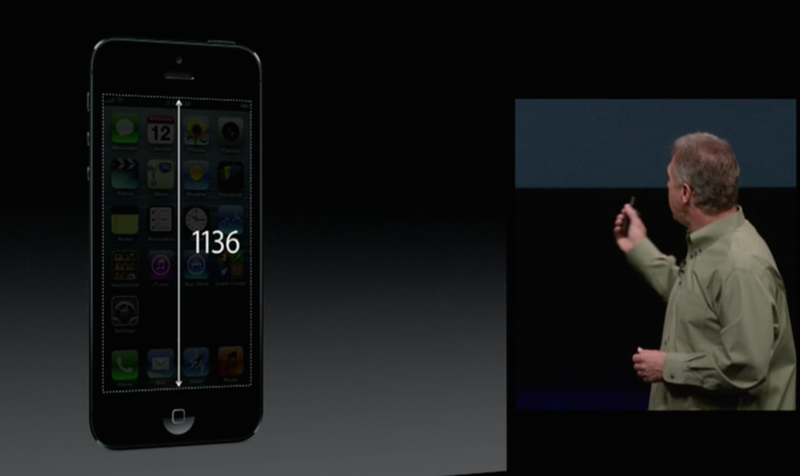 In late-2012 with the iPhone 5, Apple enlarged the iPhone’s panel to 4-inches diagonally. Apple retained the iPhone 4’s horizontal resolution of 640, but it increased the height of the iPhone 5 to 1136 pixels on the vertical axis, a story we broke almost exactly two years ago this month. 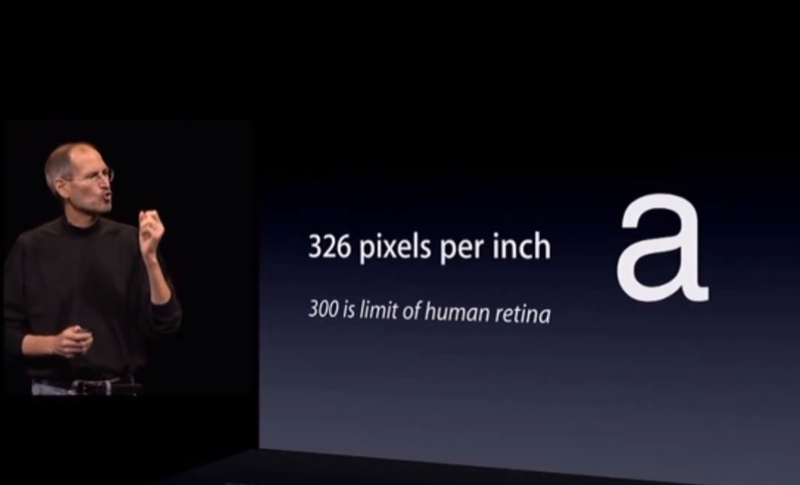 The same 2X scaling mode from the iPhone 4’s Retina display technology was retained as was the density of 326 pixels-per-inch. From a developer’s perspective, the current iPhone 5/5s/5c display has a resolution of 568 x 320, up from 480 x 320 in the original iPhone. However, there are actually twice as many pixels in each direction to create a sharper image. In other words, an iPhone 5s with a non-Retina (or “1X”) display would have an actual resolution of 568 x 320 (which is the 1136 x 640 resolution divided by 2). 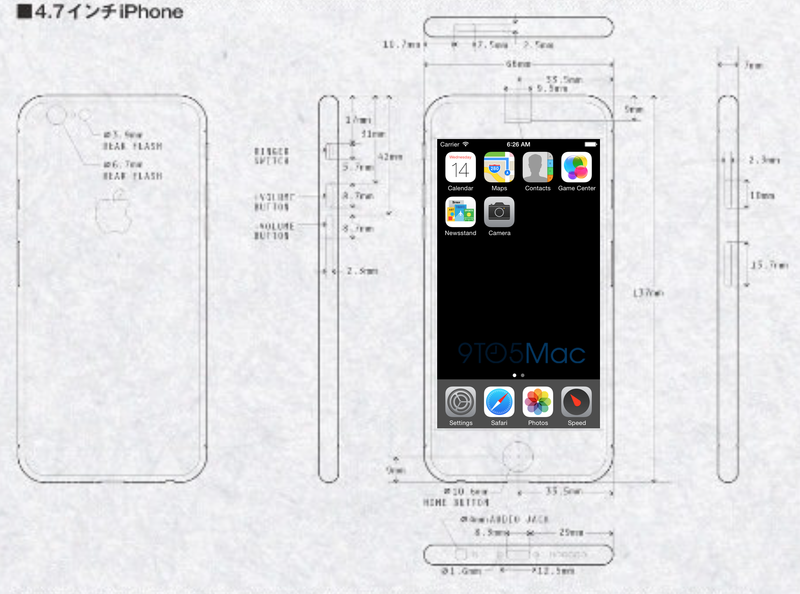 We’ll call this the “base resolution” of the iPhone 5/5s/5c. Fast forward to 2014, and Apple is preparing to make another significant screen adjustment to the iPhone. Instead of retaining the current resolution, sources familiar with the testing of at least one next-generation iPhone model say that Apple plans to scale the next iPhone display with a pixel-tripling (3X) mode. This means that Apple will likely be tripling the aforementioned “base resolution” (568 x 320) of the iPhone screen in both directions, and that the iPhone screen resolution will be scaled with an increase of 150% from the current 2X resolution of 1136 x 640. Of course, Apple tests several different iPhones and display technologies, so it is possible that Apple chooses to take another route for display specifications for the 2014 iPhone upgrade. 568 tripled is 1704 and 320 tripled is 960, and sources indicate that Apple is testing a 1704 x 960 resolution display for the iPhone 6. Tripling the iPhone 5’s base resolution would mean that the iPhone 6’s screen will retain the same 16:9 aspect ratio as the iPhone 5, iPhone 5s, and iPhone 5c. Based on the new resolution and evidence from leaked iPhone 6 parts, it seems like the new iPhone’s display will be both taller and slightly wider. This is in comparison to the iPhone 4’s screen size not changing during the transition to Retina and 2X mode and the iPhone 5’s transition to the taller, but not wider, 4-inch screen. So, regardless of whether Apple goes with a 4.7-inch or 5.5-inch panel—or both—the new iPhone(s) will have significantly more dense screens in comparison to current and past iPhones, which will result in crisper text, images, and video for users of the next-generation Apple smartphones. Also, by definition, both screens will have pixel densities that fit comfortably within Apple’s threshold for a “Retina” display. The larger and denser next-generation iPhone display means that iOS’s user-interface will become slightly larger and sharper unless Apple re-architects the layout of iOS to become more optimized for the new screen. 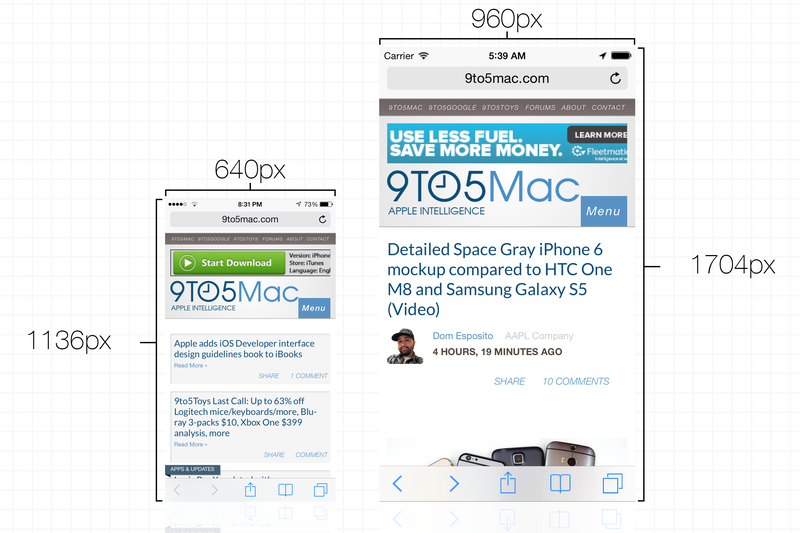 The mockup images created by 9to5‘s Michael Steeber above and below demonstrate raw pixel scale between the iPhone 5/5s/5c’s 640 x 1136 resolution display and the iPhone 6’s probable 960 x 1704 resolution screen. The sources say that core user interface elements, from iOS functions like the Home screen, Notification Center, and Settings panels, will simply appear like larger versions of those functions on the current iPhone display. However, sources also say it is likely that developers and Apple itself will be able to optimize some applications to better utilize the larger screen area. It is possible Apple could revamp the Home screen and other functions between now and this fall’s launch. For example, it would make sense for Apple to allow for applications like Safari and Maps to better take advantage of the new screen space. Game developers may choose to reposition their controls for an improved gaming experience. This screen size shift varies from the transition from the iPhone 4/4S to the iPhone 5/5s/5c, which simply entailed making the screen taller. This allowed Apple to show more new messages in Mail and add another row of Home screen icons. To test how iOS 7 would react to the 3X resolution mode for the next iPhone model, prominent developer Steven Troughton-Smith modified the publicly available iOS Simulator application used for App Store software development. 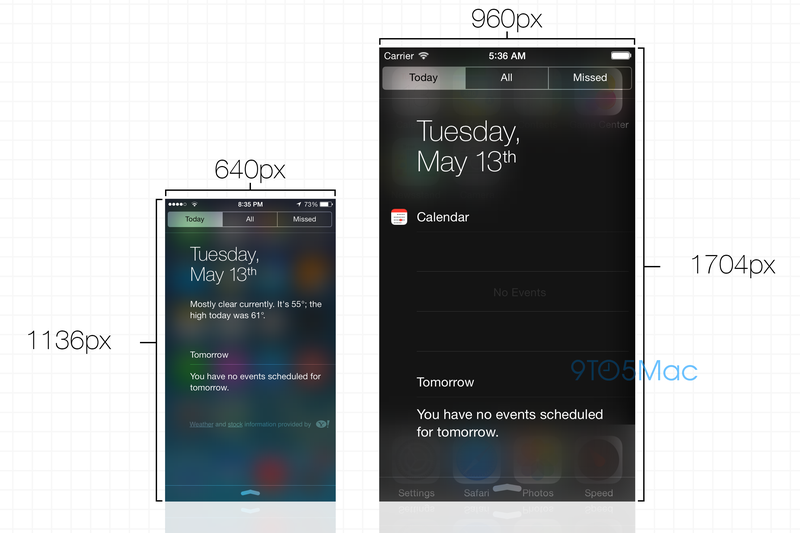 The screenshots displayed in the above mockups are sourced from that modified simulator. As can be seen in the images above, core system functions like Spotlight and the Home screen scale fairly well automatically, but applications like Calendar will need some new graphics under the hood. Apple is said to be (unsurprisingly) working on optimizing all graphics across iOS to fit the new 3X mode, so customers will experience sharp graphics across the new device. If you click the above images, you can download them in the full 1704 x 960 resolution. Back in 2010 when Apple began the transition from the standard iPhone display to the Retina display, iOS’s user-interface aesthetic was driven by Steve Jobs’ and Scott Forstall’s taste in “skeuomorphic” design. This meant a casino and green felt-themed Game Center app, a yellow legal pad-styled Notes app, and a Calendar app bound by faux leather. Now, in 2014, Apple’s iOS design is led by Jony Ive, and features more prominent content, clear text, vector graphics, and animations. According to developers, the new iOS design aesthetic’s reduced reliance on “raster” graphics means that apps can more easily be updated (or even be automatically updated) for the next iPhone’s denser, larger display panel. To prove this, Troughton-Smith tested two of his iPhone applications on the modified iPhone simulator to see how they would run. Speed (shown right) seems to run almost perfectly without any changes. Grace (shown left), another app of Troughton-Smith’s, also worked on the new display without any updates. But, of course, not all apps will automatically run with a sharp look on the iPhone 6. According to sources familiar with the new iPhone displays in testing, if an unoptimized iPhone 5 app is run on the iPhone 6, the app will fill the entire screen but the non-3X images within the app will be blurrier. Troughton-Smith’s applications scale well because they were built with vector graphics. This transition from 2X to 3X will be reminiscent to the transition from 1X to 2X when the first iPhones with Retina displays launched in 2010. Apple has been working on a new “multi-resolution” mode and developer toolset for future iOS devices that allows developers to more easily scale their applications to work on multiple new iOS device resolutions. It is likely that developers will be provided with these tools later this year so that they can begin work on optimizing apps (if even necessary) for the new iPhone’s display. Apple typically does not preview new hardware features months in advance, so Apple is unlikely to reveal the larger iPhone display size at WWDC early next month. Sources also say that Apple has developed a new A8 system-on-a-chip for the next iPhone that focuses on marginal speed improvements rather than core architectural changes, but adds significant performance and efficiency enhancements in order to improve the iPhone’s battery life. With a larger, higher-resolution display combined with the next iPhone’s far thinner body, the A8 chip will be essential to maintaining the seamless, fluid iPhone experience that Apple prides itself on. Besides a new processor, it is likely that the new iPhone will include improved LTE components for voice-over-LTE support and various other new hardware elements. Apple’s new hardware- and software-based display technologies likely opens up the door for a flurry of future, higher-resolution iOS devices. Noted analyst Ming-Chi Kuo previously indicated that Apple is working on a sharper full-size iPad, so perhaps in the same way that Apple transitioned the iPhone to 2X before the iPad, the new 3X iPhone resolution will be a precursor to improved iPad displays. Apple is also on working on some secret new iOS device form factors, high-resolution external monitors, and wearable displays, so perhaps these new technologies play into those future hardware products as well. Before introducing fresh iPhone hardware later this year, Apple will use the WWDC stage in June to discuss the next iPhone’s operating system, iOS 8. In addition to building in support for the new hardware, the new operating system features a slew of enhancements, applications, and refinements. New applications in iOS 8 likely include a Healthbook app for tracking health and fitness data, an enhanced Maps app with public transit directions support, and a standalone iTunes Radio app. Other enhancements, including a new split-screen multitasking view for the iPad, will round-out the feature-set. Sources say that Apple is seriously considering pushing back some of iOS 8’s functionality to iOS 8.1 or even later versions of iOS, including the transit mode in the Maps app. Regardless of what Apple announces, we’ll be covering WWDC extensively and looking out for more clues to what features the next iPhone will include. The latest reports indicate that Apple is preparing to launch a 4.7-inch iPhone model in August and a larger, “phablet” model with a 5.5-inch screen in September.